Klik hier voor de Nederlands-talige versie van deze review. In this review I’ll compare the Olympus OMD E-M5 Mark II to the excellent Sony A6000 that I’ve reviewed before. The Sony isn’t in the same price range as the E-M5 Mark II, as it is more a consumer camera while the Olympus is a prosumer model, but it is still interesting to see how the stack up Read my review about the A6000 here. 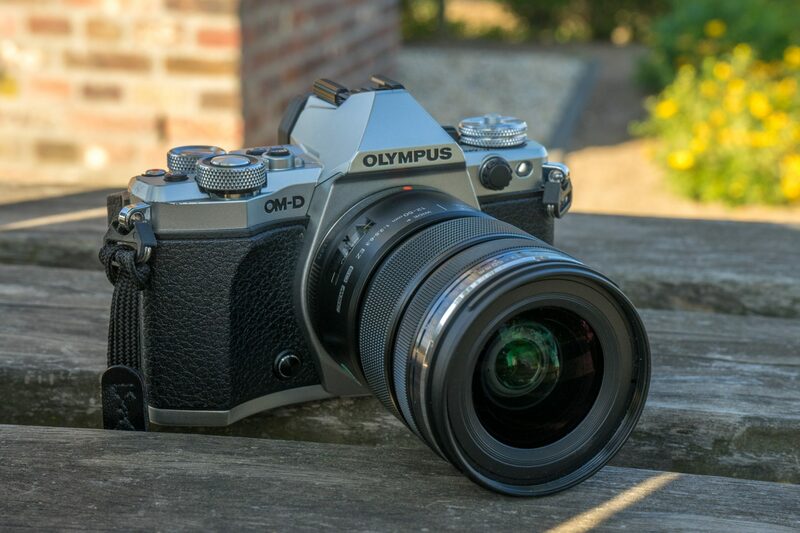 The Olympus OMD E-M5 Mark II has got a classic, almost retro looking design that resembles classic SLR cameras from the sixties and seventies. It is a matter of taste, but I like the look a lot! On the front of the camera you’ll find the OMD-logo and only a few buttons. On the left of the lens you’ll find the programmable FN-button, and on the right you’ll find the button to unlock the lens. There is also an AF-assist light and a connector for an external flash. When you take the E-M5 in your hands for the first time you’ll notice the well-built feeling it gives you. It feels like it was made out of one solid block of material. That is quite a feat since the body with battery only weighs 450 grams (1 lb), so it is a lot lighter than a DSLR and about the same weight as other mirrorless cameras. 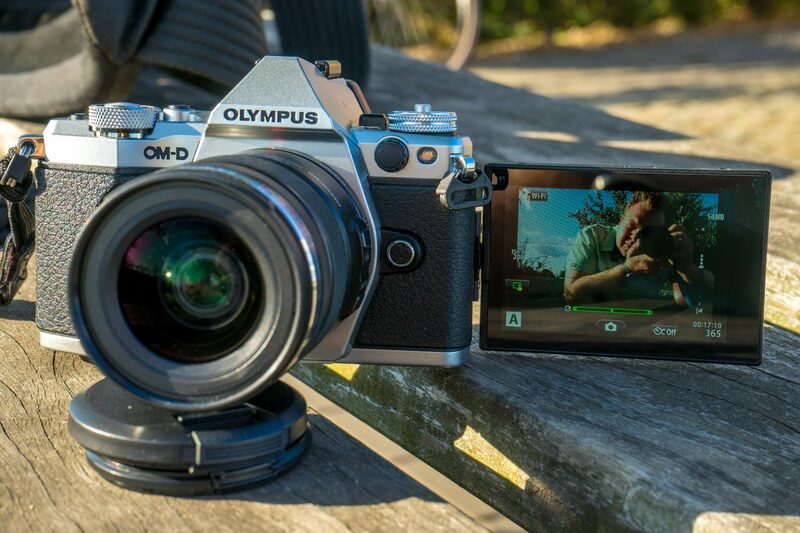 The weight is also about the same as a Sony A7, but the Olympus feels a lot more sturdy. The E-M5 Mark II is, just like the E-M1, well protected against the elements. The camera has got extensive weather sealing, making sure it can handle a rain shower without any damage (given you are using a weather sealed lens!). Olympus says the E-M5 Mark II can also handle temperatures from -10 to 40 degrees Celsius. At the back of the camera you find the generous 3 inch wide touch screen. The screen is mounted on a hinge that allows you to tilt and swivel the screen in several directions. It is even possible to use the screen in a ‘selfie’ mode, if that tickles your fancy. 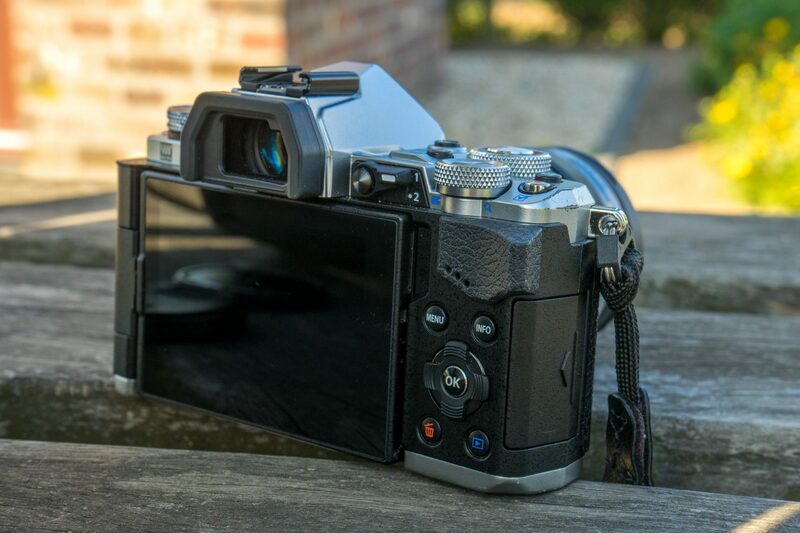 The only downside to the hinge Olympus has used is that you have to flip the screen to the side before you can tilt it up or down. Next to the screen are a few controls and the multi commander dial. The camera also has a big thumb grip. That works great to make sure you have a good grip when taking photographs, but it also gives you great grip when you have the camera in your hands when you aren’t using it. 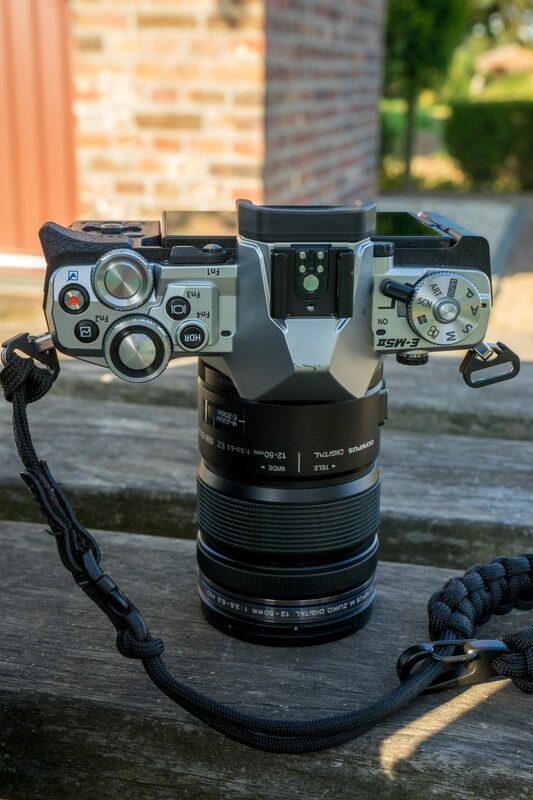 On top of the Olympus OMD E-M5 Mark II you’ll find most of the controls. On the left there is the PASM-dial, that also gives you access to the Video-, Auto-, Scene and Art-modes. You can lock the PASM-dial to make sure it doesn’t change position when you put the camera in your bag or when you take it out. The on-off switch is next to the PASM-dial. And while this works fine, I’d rather have it near my shutter release so you can turn the camera on and take a photo with just one hand. On top of the EVF you’ll find the flash hot shoe, that can be used for an external speedlight. Olympus also supplies the camera with small flash unit, that is powered by the camera. The small external unit may not be as practical as a built in one, but it is a little more advanced as you can swivel the head up and left to right. It’s great Olympus supplies the camera with this unit, so you don’t have to buy an expensive external unit for when you need one incidentally. Sony, have you read this? (the A7 doesn’t have a flash built in, but you don’t get one with the camera either). The EVF of the Olympus OMD E-M5 Mark II is big, has got an high resolution and high refresh rate. Because of this you probably never miss the OVF you were used to on your DSLR. The EVF is on par with the Sony A7, which means it is excellent and a pleasure to use. The image in the EVF is very smooth, partly because of the high refresh rate, but it also seems to profit from the excellent image stabilisation (more about that later on). The other controls on the top are to the right of the EVF-housing. The Olympus OMD E-M5 Mark II has got a large shutter release button, that is surrounded by a control dial. On the back of the camera there is a second control dial. Both feel nice and durable, with subtle clicks to indicate the steps. Next to the rear control dial there is a switch to choose between two shooting modes. There is also a record button for video and three programmable buttons. With all these buttons and dials you can easily control the camera without having to dive in to the menus. 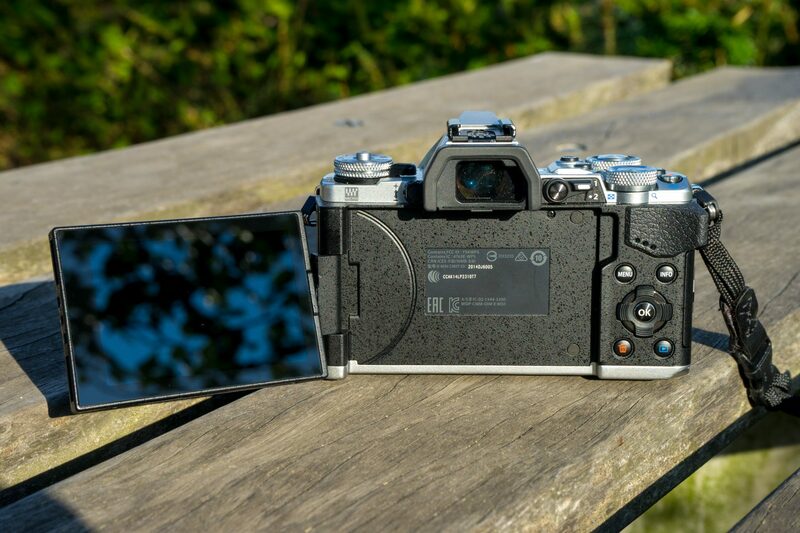 The E-M5 Mark II has got a big touch screen. To change settings on the camera you don’t really have to use the touch screen, as you can do almost everything with the buttons and dials which works fine. You can use the touch screen for ‘touch to focus’ or ‘touch to shoot’. Just touch the screen where you want your photo to be sharp and let the camera do the rest. For adjusting the most used options you can use the quick menu, you open it by pressing the ‘OK’ button on the back. Here you can adjust the transport mode, AF-mode, ISO setting and other important settings. The quick menu is great, because it allows you to change the most important settings without having to open the menu. The menu of the E-M5 Mark II is comprehensive, meaning you can adjust about everything you might want on the camera. That means you can really personalise your camera to taste. But it also means the menus are a little complex, especially for beginners or people who are new to Olympus. The Olympus OMD E-M5 Mark IIhas got a Autofocus system that only uses contrast detection. Other brands, like Sony, use a combination of contrast detection and phase detection in their mirrorless models. That should, in theory, make for a faster working autofocus system. I say in theory because the E-M5 Mark II proofs it is possible to create a fast and accurate autofocus system with only contrast detection. The autofocus system is aided by the smaller sensor giving it a bigger depth of field, so it isn’t strained as much as with a big sensor. The E-M5 Mark II has got 81 AF-points that cover a rather large part of the screen. The E-M5 Mark II has got several AFmodes: Single AF, Continuous AF, Manual AF, Single AF with manual adjustment and Continuous AF with object tracking. Single and Continuous AF work very well if you choose the AF-point yourself. The camera acquires focus fast and accurate, and when the lights go down it still works quite well. The AF does slow down a little in low light. The Continuous AF with focus tracking impresses. The camera quickly locks on to the subject and keeps tracking it throughout almost the whole frame. Only when the subject moves to the side of the frame the camera sometimes loses focus, but regains focus quickly when it moves back in to the AF zone. Focus tracking also works great when shooting video, focus is quick and quiet. The only downside to the autofocus system of the E-M5 Mark II is the wide focus area. In this mode you let the camera choose one of the 81 focus points by itself. I use this mode on my Sony cameras all the time, and they almost never go wrong. The Olympus did seem to struggle. It seemed to lock on the background most of the time, even when there was a clear subject in the front. When using the face recognition in the wide focus mode the focus was reliable, but when there aren’t any faces in sight it was a little frustrating. That was why I chose to choose the AF-point myself most of the time, except when shooting portraits. When you do that you can enjoy the great AF the Olympus had got to offer. The Olympus OMD E-M5 Mark II has got a 16 Megapixel MFT-size sensor. The MFT sensor falls between the small sensors Nikon uses in the 1 series (with an 1” sensor) and the sensors in the Sony A6000 an Fuji XT-1 (APS-C size). The MFT sensor gives you a 2x crop factor. Pricewise the E-M5 Mark II is in the same range as the Fuji XT-1 and even the original Sony A7 with its full frame sensor. Can the E-M5 Mark II keep up with its closest competitors with its smaller sensor? There has been a lot of discussion of the pros and cons of smaller and larger sensors. A smaller sensor gives you a deeper depth of field, what can be a pro when you are shooting landscapes. But it limits the possibilities to create subject separation in, for example, portraits. But a smaller sensor normally has got less dynamic range and the noise performance can be more limited. Nevertheless the E-M5 Mark II with its 16 Megapixel sensor performs very well. Up to about ISO3200 you can shoot without losing too much detail. ISO 6400 can be used for ‘emergencies’, as long as you realise that you may lose some detail or you end up with a photo with some visible noise. The noise performance is about the same as the Sony A6000. 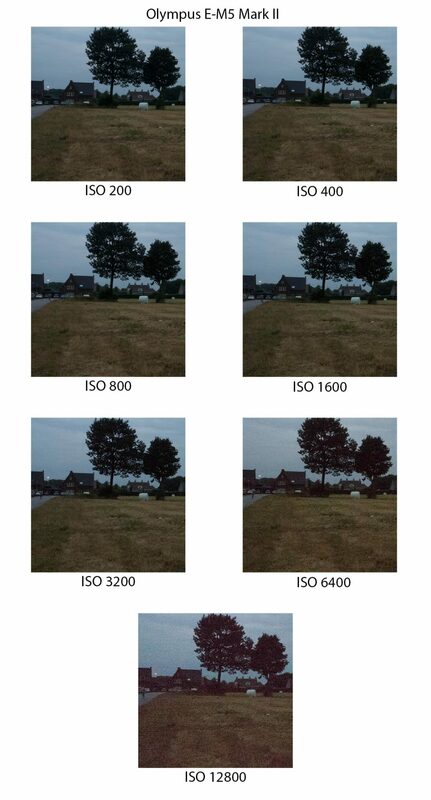 For a fair comparison you should resize the photos of the A6000 to 16 Megapixel (instead of the original 24 Megapixel files the Sony produces). Doing that will improve the noise performance of the Sony al little, making it perform about 1/3 of stop better than the Olympus. That’s nothing to be ashamed of, since the performance of the Sony is very good. One thing I did notice is that the noise of the E-M5 Mark II is quite equal, so a noisy photo does still make for a nice grainy black and white image. The dynamic range of the sensor is quite good, but it can’t keep up with the bigger sensor of the Sony. Given the size of the sensor I can’t don’t think it is a problem. 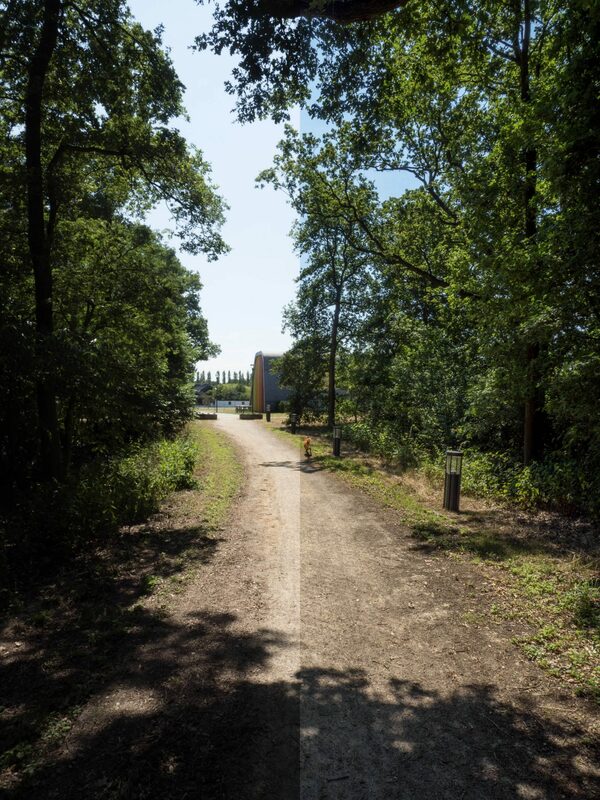 RAW images (or ORF as Olympus calls them), give you quite some headroom for editing in Lightroom. There still is a lot of information in the darker parts of the images. High lights do tend to get overblown a little quicker than with the Sony, so it’s better to underexpose a bit to prevent that from happening. Dynamic range, left original right edited: shawdows +100, highlights -40. The E-M5 Mark II has got an advance image stabilisation system built in to the body (IBIS). IBIS allows the sensor to move around in the body to compensate for shaking and vibrations. Because the IBIS is built in to the body you can use it on every lens you, even old and converted DSLR lenses. IBIS seems to perform even better than I’m used to with stabilisation built in to the lens like I know from Sony and Nikon. The IBIS works in 5 directions, instead of the 3 directions most lens image stabilisers use. With a little effort I was able to shoot useably sharp images at 40mm (80mm full frame equivalent) with shutter speeds as low as 1/5 of a second. IBIS also works while shooting video, making them smoot even when you shoot handheld. All in all the IBIS works very good, and the best thing about it is that you don’t even notice it (in an good way, it just works). The Olympus has got another trick up its sleeve. The camera can use the IBIS to create images with a much higher resolution than the 16 Megapixel sensor can create on its own. The high resolution mode only works when you set the camera down on a tripod or other stable platform, and when you shoot static subjects like landscapes. The camera uses the IBIS to quickly move the sensor around while it takes 8 separate images. The software combines those eight images in one 40 megapixel photo. You don’t get a 64 megapixel images (8*16 Megapixel) because the camera uses some oversampling to create a higher image quality. The high resolution mode works great and the created images are a lot sharper than the normal 16 Megapixel photos. This is a great addition for landscape photographers, allowing you to create an image with a resolution that even bests the Nikon D810! Like you may expect form a modern camera in this price range, the E-M5 Mark II has got WiFi to connect it to your smartphone. The connection is handled by the Olympus Image Share app, that is available for both Android and iOS. Unfortunately both my iPhone 5c and my Samsung Note 4 couldn’t connect to the E-M5 Mark II I’ve used for this review. I haven’t read anything online about these problems being structural, so I think it is a individual problem of ‘my’ Olympus OMD E-M5 Mark II. The E-M5 Mark II has got advanced video capabilities. Using the IBIS you can shoot smooth looking video even when shooting handheld. I’m far from a videographer, so I haven’t tested the video mode extensively. You can shoot video in Full HD, in 24, 25, 30, 50 and 60 frames per second, and can use MOV or AVI file formats. 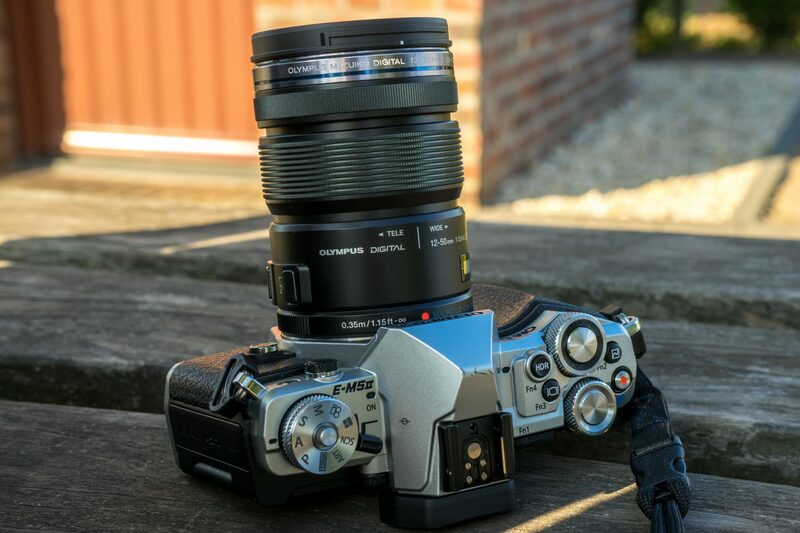 In this review I’ve used the Olympus kit lens, the 12-50mm f3.5-6.3 EZ. With the 2x crop factor of the MFT sensor you have a full frame equivalent zoom range of 24 to 100mm. With that range you have a nice all round usable zoom range. With an aperture ranging from f3.5-6.3 the lens isn’t very bright, and combined with the smaller sensor the aperture isn’t wide enough to create a lot of background separation without getting very close to the subject. The lens does have some fun extras. It has got Electronic zoom, that helps you zoom smoothly in video. If you don’t care for electronic zooming you simply slide the zoom ring back and use the lens in manual zooming mode. This isn’t a rotating ring that activates the zoom motor like you get in other electronic zoom lenses (like the Sony 16-50 PZ), but a real manual zoom that connects the zoom ring directly to the zoom mechanism. This work good, but the mechanism does grind a bit when you zoom. Besides the electronic zoom, the lens also has got a macro mode. You select macro by depressing the lock button on the left side of the lens and sliding the zoom ring forwards. The macro mode works well. It isn’t a replacement for a real macro lens, but for the incidental close up it works fine. You can’t zoom in macro mode. The sharpness is more than good enough for a kit lens. The centre of the image is sharp, and the edges of the image are acceptable. When you close the aperture down a little the edges improve, making the overall image quality even better. For the small extra price this lens will cost you in a kit I’d always get it. In the following gallery you’ll find a few of the photos I took with the E-M5 Mark II during my review period. All photo were shot in RAW and converted and edited to taste in Lightroom. 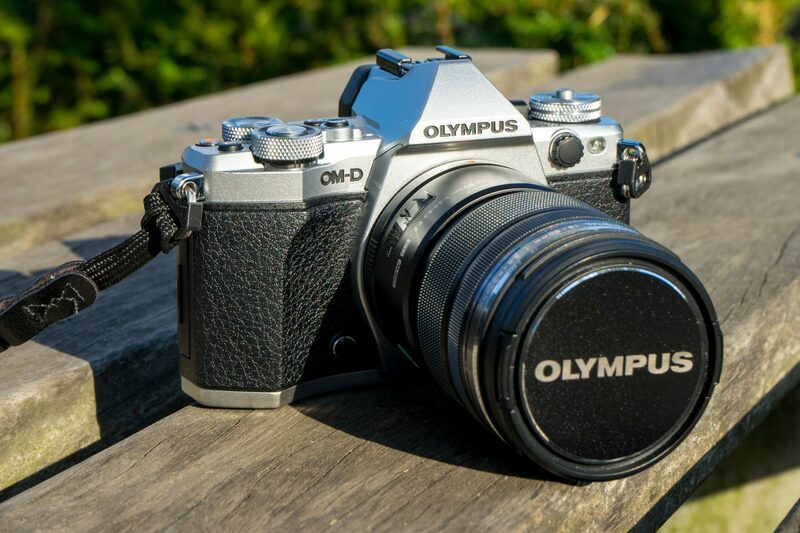 In daily use the Olympus OMD E-M5 Mark II is a pleasure to work with. It combines a low weight and small size with great ergonomics. Because there are a lot of controls on the body you can adjust most of the important settings on the fly. It feels like an expensive, high end product with a very high build quality. RAW and JPEG images have pleasing, natural colours right out of the camera and offer you the possibility to edit them to your liking. If you don’t care for a lot of post processing you can always choose one of the image profiles to create the desired look right out of the camera. The MFT size sensor performs very well, and the files have enough dynamic range and noise performance is good. In the high resolution mode the images have a higher resolution than the Nikon D810. The smaller sensor does mean this camera may not be for everyone. For the same price you can buy a camera with a bigger sensor that offers even better resolution, dynamic range and noise performance (like the Fuji XT-1 or the Sony A7). But because the 16 Megapixel sensor does perform very well for its size you don’t have to write off the E-M5 Mark II just yet! The E-M5 Mark II strikes back with the impressive image stabilisation in the body, that works with every lens (even converted old lenses). It also offers extensive weather sealing, so you don’t have to put your camera in your bag for every drop of rain. 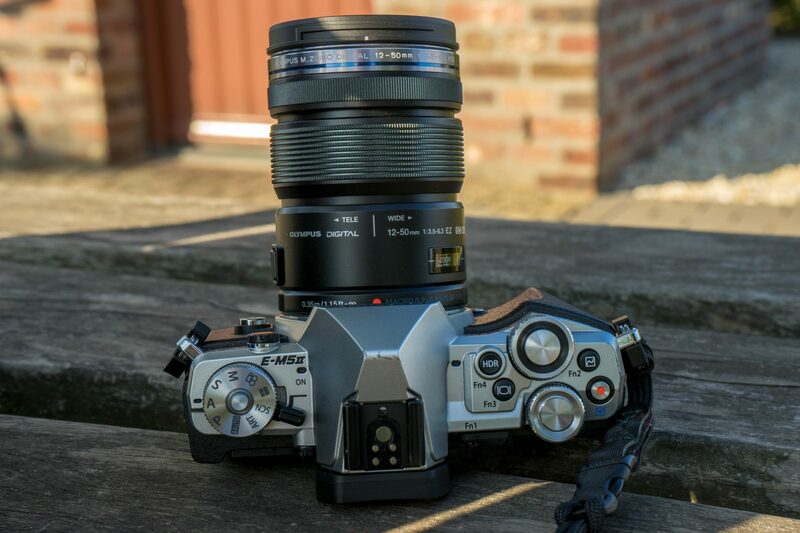 Combine that with the wide range of lenses that are available for the MFT-lens mount (made by Olympus, but also Panasonic and alternative brands like Samyang) and you understand why the original E-M5 had a lot of fans. The E-M5 Mark II improves over the original making it an even better camera. So, if you are looking for a great MFT-camera, the E-M5 Mark II is the one I’d get.